Having been ordered by Mahāprabhu to take disciples, Saranga Ṭhākura decided that he would make a disciple of the first person that he met the following morning. As fate would have it, the next morning, a dead body washed up against him while he was taking bath in the Ganges. He revived the corpse and made him his disciple. This disciple was known as Ṭhākura Murari, or sometimes as Saranga Murari. Vraja’s Nāndimukhi became Sāraṅga Ṭhākura in Gaura-lila. Some people say that he is Prahlad, but that is not the opinion held by my father. Śrī Saranga Ṭhākura is mentioned in the listing of branches of the Chaitanya trunk of the tree of devotional service along with Rama Das, Kavidatta, Gopal Das and Bhāgavata Acharya (Chaitanya Charitamrita 1.10.113). He is also known as Sarnga Ṭhākura, Sarngadhar and Sarngapani. He used to live in Modadrumdvīpa, which is the island in Nabadvīpa that represents, of the nine types of devotional service, the service attitude. The name of the town is Mamgachi. He would sit in a secluded place by the banks of the Ganges to perform intense bhajan. Through these practices he obtained many miraculous powers. Śrīla Bhakti Siddhānta Sarasvatī Gosvāmī Prabhupad writes in his Anubhāṣya in Chaitanya Charitamrta: “Having been ordered by Mahāprabhu to take disciples, Saranga Ṭhākura decided that he would make a disciple of the first person that he met the following morning. As fate would have it, the next morning, a dead body washed up against him while he was taking bath in the Ganges. He revived the corpse and made him his disciple. This disciple was known as Ṭhākura Murari, or sometimes as Saranga Murari. In the Gauḍīya Vaiṣṇava Abhidhāna, it is further said that Murari was a boy who had been killed by snake bite and his parents had set his uncremated body afloat on a raft in the Ganges, as was the custom in that time. Saranga Ṭhākura revived him by giving initiation to him. Thus, his name Saranga Murari, who became an empowered preacher of Mahāprabhu’s dharma by guru’s grace. Descendents of Saranga Murari’s disciples still live in a village named Shav. Saranga Ṭhākura’s deities were served in the town of Mamgachi. The original temple was built in front of a bakula tree. 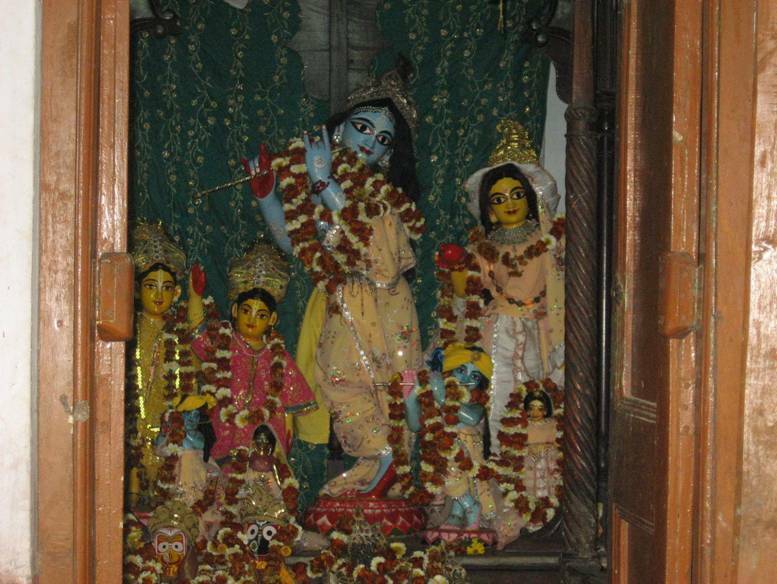 The deities of Radha Gopinath worshiped by him can be seen in this temple, as can the deity of Mahāprabhu’s other associate, Vasudeva Datta Ṭhākura, Śrī Madana Gopal. The devotees who do parikramā of Nabadvīpa Dham visit this temple for darshan. Śrīla Bhakti Siddhānta Sarasvatī Gosvāmī Ṭhākura established a temple not far from the above-mentioned home of Saranga Murari at the birthplace of Vrindavan Das Ṭhākura. Saranga Ṭhākura disappeared on the thirteenth day of the waning moon (kṛṣṇā trayodaśī) in the month of Agrahayan. 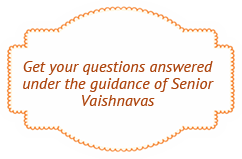 An alternative opinion is that he disappeared on the Asharh kṛṣṇā caturdaśī.